The IT resources in the Laboratoire de Biochimie Théorique have evolved considerably in recent years. This reflects the inherent increase in calculation demands of the laboratory and the renewal of the IT team, and follows particularly the awards of numerous European and national endowments including the ERC "Thermos", the ERC "ABIOS", the Labex "Dynamo", and several ANR grants. 1x bi Intel Xeon X5560 (Nehalem platform) node for test jobs only. 12x bi Intel Xeon E5-2698v4 (Broadwell platform) / bi Nvidia GeForce GTX-1080Ti nodes. Since our financial allocations are limited, and for better project control, we have fully designed and deployed these computing and storage ressources with open-source solutions by home-made way. 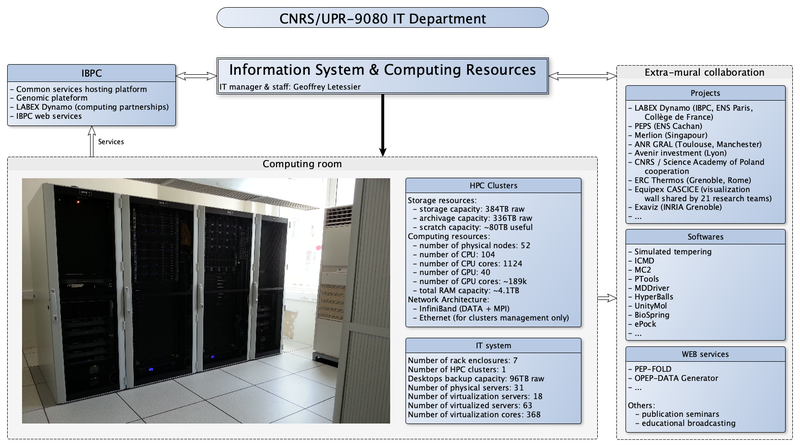 Our server room, located on the 3rd floor of the Institut de Biologie Physico-Chimique, has been completely redesigned to accommodate these HPCCs, our lab information system, and related services for other labs in the Institute. For more information about our computing resources (for both info and use guide), you can access the dedicated wiki.